I have to thank my daughter and son-in-law for an amazing gift they presented to me not long ago. They listened (ever-so-patiently) as I waxed lyrical about Simone Martini’s painting, St. Louis of Toulouse crowning Robert of Anjou, which hangs in the Museo di Capodimonte at Naples. They heard (again, I’m afraid) the story of those two brothers, my favorites of the Angevins of Naples, about their long imprisonment from youth to young adulthood, how Louis was called to the Franciscan order and defied his father to answer that call, how his charismatic brother Robert, a third son, became heir to the throne of Naples because of Louis’s decision, and how Martini’s painting contains many symbols of the brothers’ complex relationship and history. It was a gift that they listened so attentively to the story that has fascinated me, and charged my imagination, for decades. But a few weeks later, they showed up at my house… with the painting!! Of course, not the one from Naples–the original is not for sale. Mine is a reproduction, a knock-off from one of those websites that will make you a copy of any oil painting you like, in any size you want. I have it framed, now, and hanging in my bedroom. The saint (Louis of Toulouse) and the king (Robert the Wise) watch over me as I sleep. 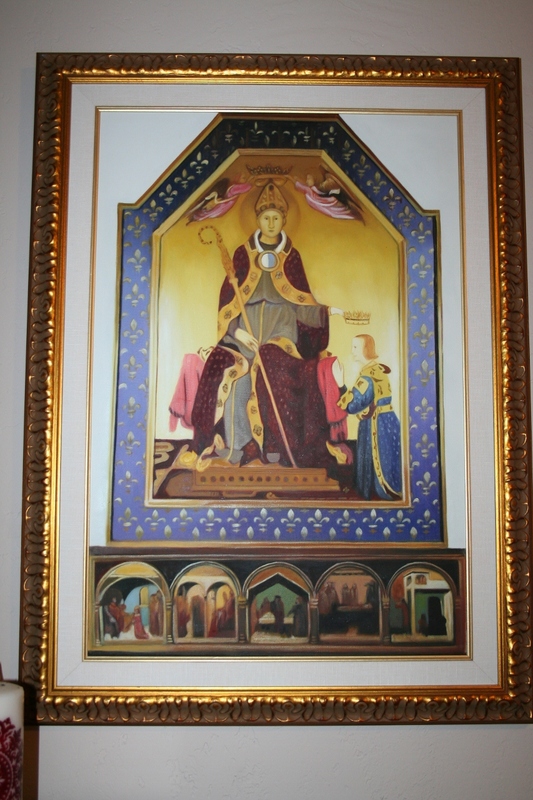 This entry was posted in History, Uncategorized and tagged Capodimonte museum, history, Louis of Toulouse, Naples, Robert the Wise, Simone Martini. Bookmark the permalink. Wonderful! And I loved that you viewed the fact that they listened to your story as a gift. It IS a gift to listen, isn’t it! Wish I was better at it myself. Thanks for reading yet another post, Jane! Another great presentation, Sandy, but what interested me the most was that there is such a website where you can order a print of any famous oil painting so I want my family to know that I would like a print of a “Russell” painting – you know the guy who paints indians and cowboy scenes in Montana – his museum is in Helena, Mt. I want the print called “The Lookout”….so there you have it. So much for Italian blogs, eh?